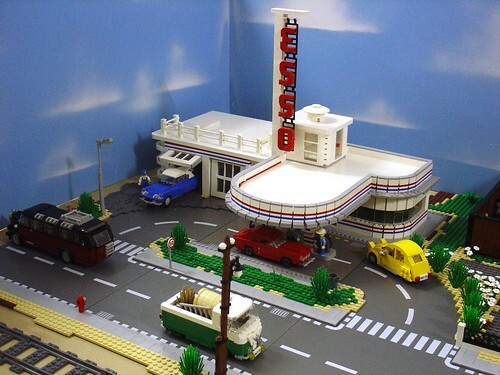 Brick Town Talk: Gas and Go - LEGO Town, Architecture, Building Tips, Inspiration Ideas, and more! Royville, France - (BTT) What could be a more fitting place for an Art Deco masterpiece than the country that coined the term. The wonderful curved facades, striped in the colors of the French flag, gives this petrol station a streamlined look that would have complimented the automobiles of the era. Great find! Nice to see another post from you!